This course discusses the need for an operation and maintenance (O&M) plan for a landfill gas collection system that addresses the following: extraction wells; LFG monitoring probes; condensate collection and treatment; and flare station. A site-specific monitoring program should be established that is flexible and performance based. LFG needs to be monitored on a regular basis to enable adjustments to be made to the wells to maximize extraction, prevent migration, and minimize drawing oxygen into the landfill. The procedures need to be regularly evaluated as changing climatic and operational conditions can have an effect on the results obtained. • Learn how to employ LFG monitoring probes. This course is intended for civil engineers, geotechnical engineers and other professional engineers, landfill operators and construction managers wanting an introduction to operation and maintenance of landfill gas collection systems. This course will give professional engineers, landfill operators and construction managers an introduction to operation and maintenance of landfill gas collection systems. 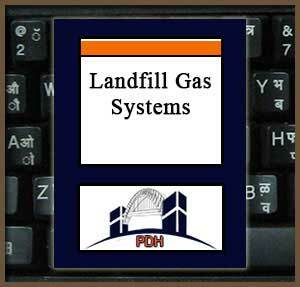 This is an introduction to landfill gas collection and management systems and equipment. After completion of this course you will be prepared to address land fill gas monitoring, collection and control issues.